Navaratri is coming, a very good period for increasing our spiritual practice and our awareness in daily life, few tips on how to get the most of it. In this fall, Navaratri is taking place from the 21st till the 30th of September 2017. Navaratri is known traditionally as one of the best period to enhance the effects of our meditation and our spiritual practice. At your cushions, it starts soon. Nava means nine and Ratri means nights. 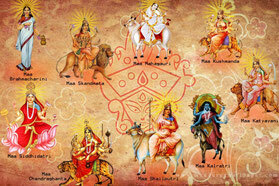 Navaratri is traditionally the Indian festival of the nine nights of the Goddess Durga. During these nine nights, Durga, the Mother Goddess fights the multiple manifestations of the demons she meets in her quest of purification. She will, herself, take different forms in order to be victorious from this battle. 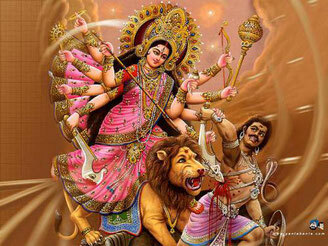 Durga is one of the main female archetypes present in the Indian pantheon of Gods and Goddesses. She incarnates a figure of the divine feminine, which supports us in our spiritual evolution. She is the Mother Goddess who guides us and helps us to get rid of our attachments, our inner resistances, everything that keeps us in ignorance and suffering. 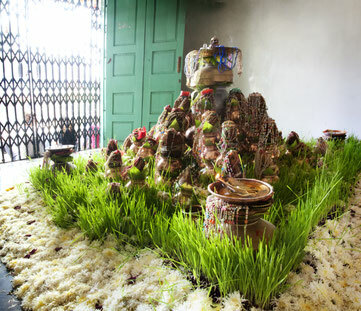 These nine nights symbolise our inner struggle to purify the negative tendencies of our lower self, the ego, the mind. Durga is often showed as riding a tiger (or Lion depending on the illustration), this represents her unlimited power, putting the virtue in service to destroy all evil tendencies. Her multiple arms indicate that to overcome the impulses of negativities, man must develop different qualities in different situations and circumstances: detachment to overcome selfishness, self-knowledge to overcome anger, generosity for greed or resentment, etc. Love ultimately is the universal weapon that allows to heal the feeling of separation. Why and how the period of Navaratri can be beneficial for us? The Indian Tantric tradition is known for its fascination and deep knowledge on the cycles of Shakti, the Manifestation, the fluctuations of the energy-conscious field at the level of our planet and of the universe. These fluctuations affect us deeply, often in a completely unconscious way. 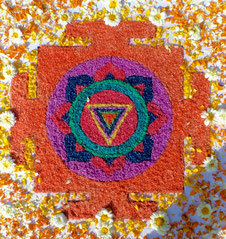 Tantra is a huge resource of knowledge for the study and the more conscious use of these cycles of nature and energy. Some periods or specific moments of the year are recognised by the Tantric approach as ‘portals’, open gates that can help us to significantly increase the results of our spiritual practice. A simple way to understand the importance of these specific periods is that they serve as amplifier. The results of our efforts and our practice are simply multiplied considerably if we recognise these cycles and use them more consciously. Navaratri is one of the most important period of regeneration and harmonisation of our energy at an individual and planetary level. We can acquire and crystallise more rapidly and harmoniously various aspects of Shakti. 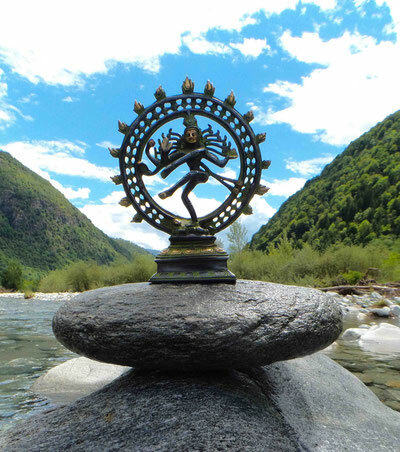 By harmonising our energy, our ‘shakti', we open naturally to a more comprehensive and complete perception of our being, consciousness and energy being closely interconnected. The symbolism of the 9 nights of Durga is not limited to the frame of the Hindu religion, it is not strictly related with to a specific culture and religious practice, it transcends it. In other words, we do not need to be Hindu in order to benefit from meditating more during this period. It is a cycle of time that everyone can use in order to increase their spiritual evolution, it corresponds to universal archetype and shifts into energy and can be used. How does this cycle of Navaratri work on us ? The work of purification will gradually widen and deepen during these 9 days. It can affect all levels of our being simultaneously or successively, but the Indian Tantra describes the progression as follows: this period of 9 nights / days is symbolically divided into three cycles of three nights. The first cycle is represented by the Goddess Durga, symbolising a purification taking place mostly in the physical world. In terms of yoga, we speak of the physical body and energy primarily, making it a beneficial period to purify our diet for fasting or practicing conventional purification methods. The second cycle is symbolised by the Goddess Lakshmi and promotes the purification of our emotions, the astral body. This is helping to bring awareness to all our emotional knots, projections that we carry towards the others and that we often overlook as not being initially coming from us but being rather the fact of others. The third cycle is under the Goddess Saraswati, it is considered linked more specifically with the purification of our mind at the deepest level, to help us to detach ourselves from our false beliefs, which limit us in our perception and prevents us to open ourselves to the recognition of the depth of the Self. This is in terms of yoga connected with the purification of the mental and causal / spiritual body. Whatever is the level involved, it constitutes an invitation to take more self responsibility in our acts, emotions and thoughts, by realising that whatever comes to us in our daily life is just but a reflexion of our own projections, beliefs and ideas about what reality is and how we interact with it. It is deeply connected with the roles we are identified to in our daily life and that restrain us from a more vast perception of truth. By rising our awareness, we can simply free ourselves more and more from the ignorance that keep us into suffering and open towards more clarity and happiness. How to make the best use of this beneficial period? By paying more attention to what we eat and drink: the purity of our diet, drink more quality water consciously, hydration is a very important tool to help to purify and free locked energy-emotions from our body. By Taking the opportunity to amplify our meditation and deep relaxation, in terms of duration and / or frequency. For example by choosing to get up earlier to have more time to meditate. By taking small pauses during the day and adopt micro-practices of awareness: we stop for a while, close our eyes, breathing deeply three times and observing for one minute what ever manifests to us without judgment, just presence. If possible, do this micro-practice at least 5 times per day or more. By adopting periods of silence during the day to recenter ourselves. By looking at our life purposes, what direct us in general, how we are tuned or not with the voice of our Heart, or intuition and evaluating how to adjust ourselves more to it. By connecting more with nature and if possible silently, through walking, meditation, etc. By bringing more attention to our mental projections, expectations, emotional games that arouse when we interact with others. If necessary doing a practice of writing what bothers us to bring it to a deeper level of introspection, tracing how we become identified to our masks and fall under the spell of negative repetitions in our life. By paying more attention to our dreams, their symbolism and their message. These are just few ideas of what can be done during this auspicious period, obviously there are much more, follow your heart and see what can help you to expand your consciousness to new horizons and understanding of yourself and of reality. Happy Navaratri to all of you !